The United Nations Commission on Human Rights, which opened its fourteenth session at UN Headquarters today, elected R. S. S. Gunewardene (Ceylon) as Chairman. Mr. Gunewardene is (left) presiding. 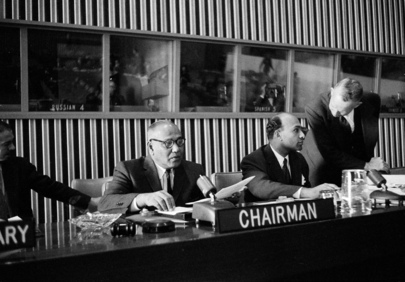 At right, is John P. Humphrey, Director of the UN Division of Human Rights; and seated is Kamleshwar Das, Commission Secretary.